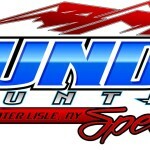 Thunder Mountain Speedway is a three-eighths-mile banked clay oval hosting weekly stock car racing on Saturday nights from April through September. The speedway has undergone numerous improvements since Karl Spoonhower returned to ownership in 2013, including the complete resurfacing of the track’s clay, an expanded/reconfigured turn three, a reworked entrance road, new lighting and a general clean-up of the concession stands, bathrooms, and the facility. Thunder Mountain offers a family atmosphere, stadium-style concrete hillside seating for 2,500 spectators, concession stands offering delicious food items, novelties and more. Parking and camping on the premises are always free. All seating is general admission. Tickets are sold at the gate on race night. 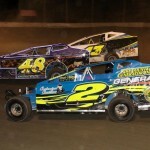 Weekly racing at Thunder Mountain is headlined by the powerful big-block/small-block Modifieds outfitted with sail panels. Other regular divisions include Sportsman, Crate 602 Sportsman, IMCA Modifieds, Rookie Sportsman XCel 600 Modifieds, Street Stocks and Four Cylinders. Here it is folks! The rest of 2018 Thunder Mountain Speedway Racing Schedule.